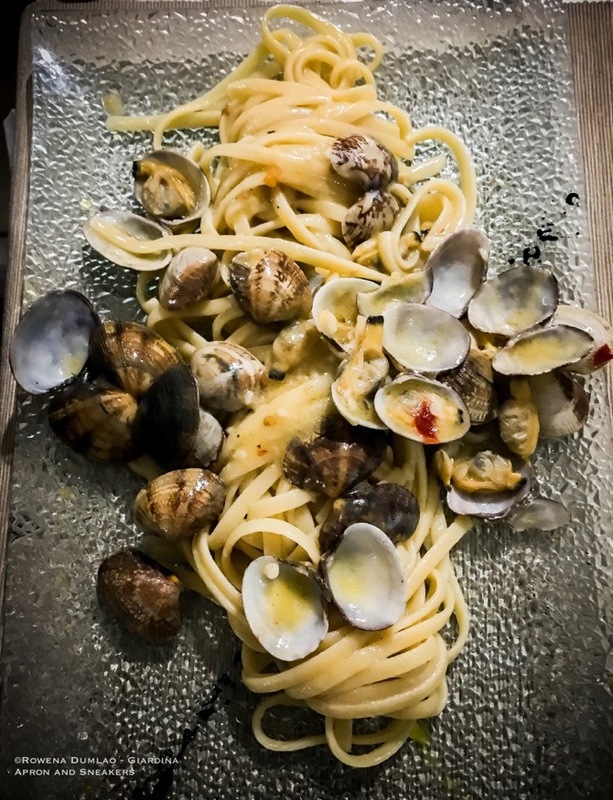 When you're in Naples, don't forget to eat your way around because it's one of the best cities in Italy where you can get phenomenal food. There are two things that I love about the Neapolitan cuisine: the pizza and the seafood dishes. 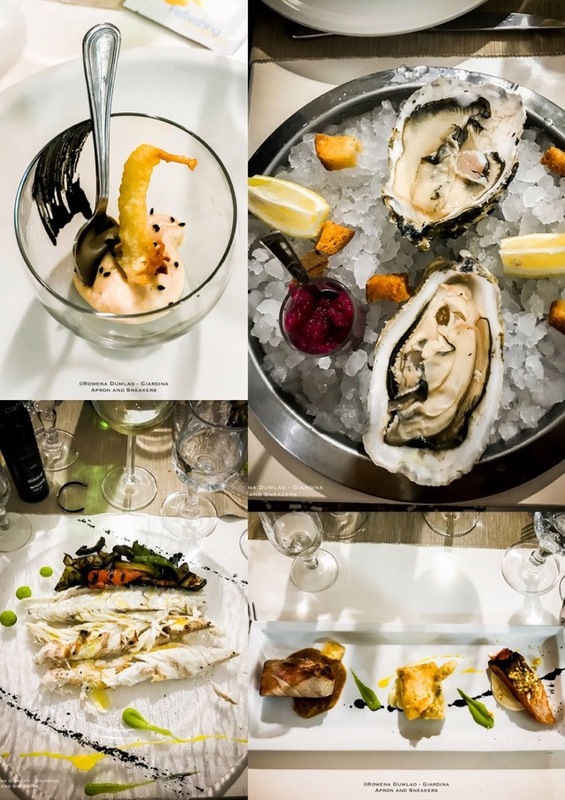 In this post, I'm going to introduce to you a splendid discovery where seafood dishes abound with excellence in quality. 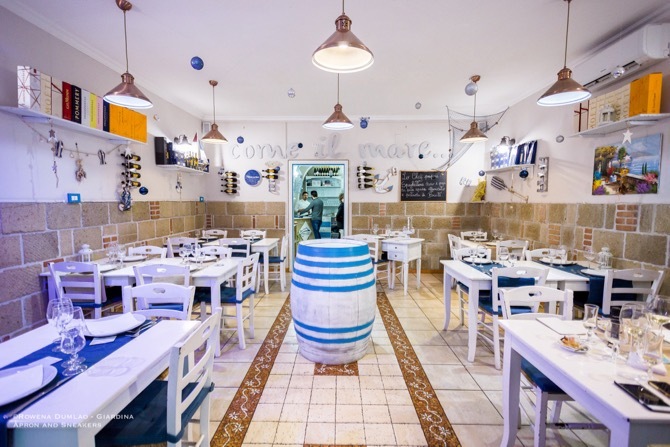 Osteria Del Mare, a typical seafood restaurant, located just off the Caracciolo seafront, specializes in seafood dishes of the Neapolitan cooking tradition. At the recommendation of a Neapolitan friend who frequents the restaurant for their commendable fish dishes, I booked a table for lunch. There are a few outdoor tables with a patio heater so even in the cold months, it's possible to eat al fresco. 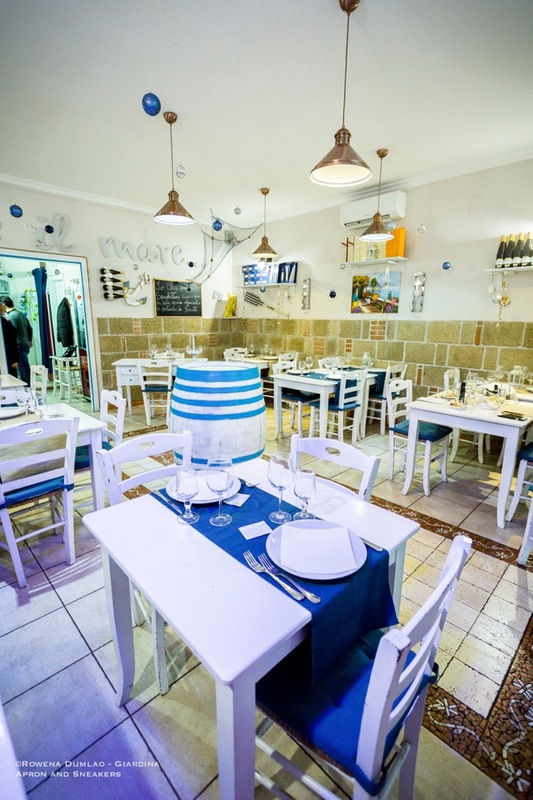 The door of the restaurant opens to a cozy square room with about a dozen white wooden tables with light blue table runners and matching chair cushions. The walls have painted oars, anchors and nets which strongly suggest that fish reigns inside. 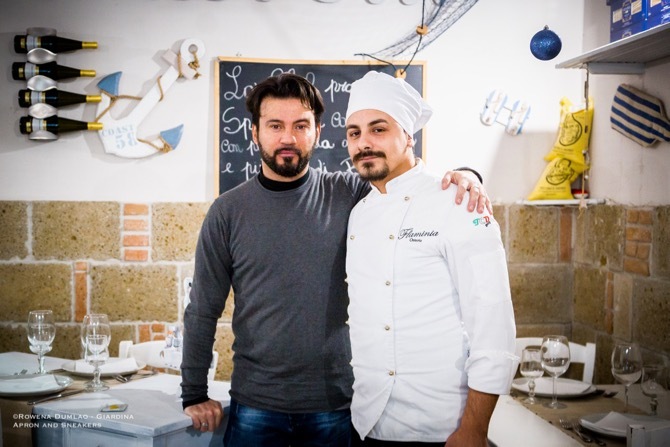 Danilo Saccenti opened Osteria Del Mare along with Chef Ivano Picardi, pursuing a goal of creating seafood dishes that use kilometer zero products and the sea catch of the day. 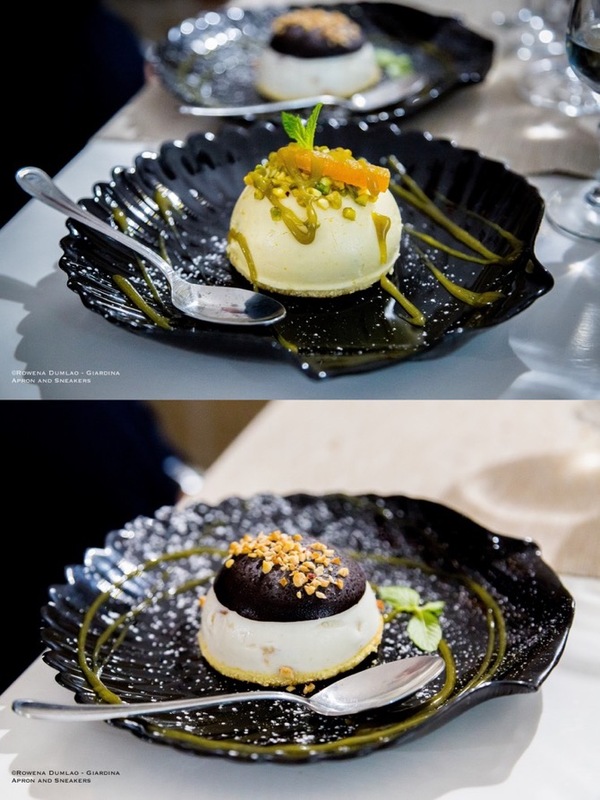 Having collaborated with renowned Italian and foreign restaurants, Ivano's dishes are influenced by his culinary experiences and personal touch but still maintains the philosophy of traditional Mediterranean cuisine. 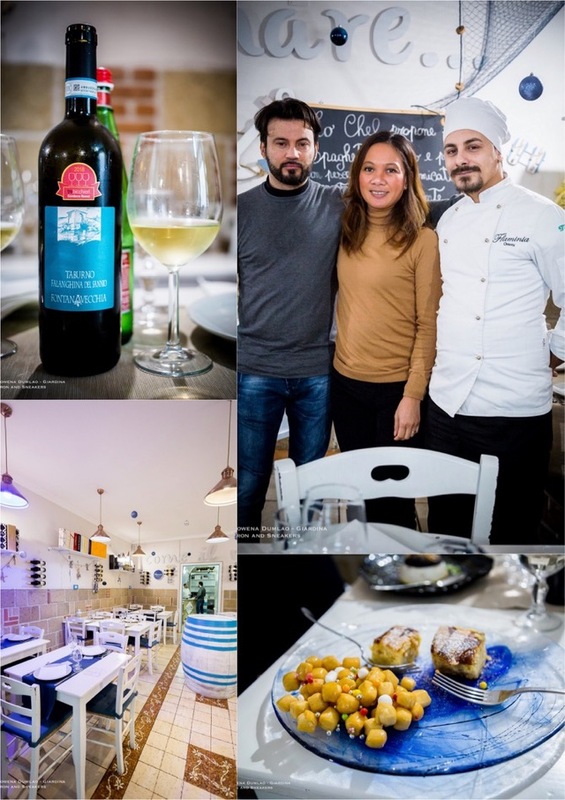 At Osteria Del Mare, you can get traditional seafood dishes like their delectable Spaghetti alle Vongole or your choice of cooking for their Catch of the Day like oven-baked in salt (al sale), oven-roasted (al forno), cooked with citrus fruits (agli agrumi), fried (fritto) or my most preferred way of cooking - grilled on the fire (alla griglia). Smoky, moist and cooked perfectly, my grilled fish with grilled vegetables simply drizzled with local extra virgin olive oil were really delicious. The chef's original dishes deserve attention because the flavors of the sea are exalted with the right touch of innovative tastes and textures. For a more fulfilling gastronomic experience, pair your food with a good regional white wine that their wine expert can recommend.